Sermon - Palm Sunday - Christ cleans out the temple, making room for Him. Recorded LIVE at the St. Peter Armenian Church Youth Ministries' Center, Glendale, California on March 24, 2013. Sermon - Sunday of Advent - the Second Coming of Christ, St. Gregory's Entrance to the Pit, briefly on Pope Francis' election. 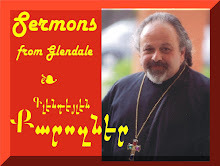 Recorded LIVE at the St. Peter Armenian Church Youth Ministries' Center, Glendale, California on March 17, 2013.